John Boldrick – Canadian Fighter Rankings today in Mixed Martial Arts, rankings mean everything. What was once a simple way for fans to keep track of who they thought was the best has transformed into much more. For years, MMA media sites have published rankings, displaying who they think is the best. Recently, the UFC has even adopted an official system to show who is at the top. As the sport continues to grow, we can expect to see more rankings in an attempt to legitimize it and bring it to the forefront of the mainstream. When it comes to ranking Canadian fighters, it gets a little difficult. Consideration must be given to not only those fighting for high level organizations such as the UFC and Bellator but also established Canadian promotions such as Maximum Fighting Championship and Aggression Fighting Championships. Some fighters may not have big stage experience, but do have a number of fights on the regional circuit to back up their skills. Another factor is the number of fighters. While Canadian talent runs deep in divisions such as welterweight and lightweight, it tends to thin out as the weight climbs. As such, the heavyweight division will only have a top five. This is based more on the number of fighters that regularly fight in the division, as many light heavyweights will jump up for a fight here and there randomly just to stay busy. With the previously mentioned MFC looking to introduce a heavyweight title in May, one can be sure that the division will continue to grow and become loaded with talent in the future. Smealinho Rama (6-0). 20 years old. Last fight: KO win over Mike Hackert. Mike Hackert (6-2). 25 years old. Last fight: KO loss to Rama. Tim Hague (14-7). 29 years old. Last fight: TKO loss to Hackert. Scott Fraser (5-2). 24 years old. Last fight: submission win over Matt Acorn. Ryan Jimmo (17-2). 31 years old. Last fight: decision loss to James Te Huna. Roger Hollett (13-4). 34 years old. Last fight: decision loss to Matt Hamill. Zach Blaber (7-2). 31 years old. Last fight: KO win over Andrew Buckland. Nick Penner (11-3). 33 years old. Last fight: KO loss to Cody Donovan. Martin Desilets (11-3). 37 years old. Last fight: TKO loss to Hollett. Victor Valimaki (17-8). 31 years old. TKO win over Tim Chemelli. Tim Chemelli (10-3). 31 years old. Last fight: submission loss to Razak Al-Hassan. Mike Kent (9-1). 29 years old. Last fight: TKO win over Cody Krahn. Peter Nolan (4-1). 33 years old. Last fight: Submission loss to Cody Donovan. Adam MacDonald (3-0). Last fight: TKO win over Jon Ganshorn. Nick Ring (13-2). 34 years old. Last fight: decision loss to Chris Camozzi. Joe Doerksen (49-16). 35 years old. Last fight: decision win over Kalib Starnes. David Loiseau (21-10). 33 years old. Last fight: TKO win over Chris McNally. Vaughan Anderson (16-1-1). 33 years old. Last fight: decision win over Haejun Yang. Dennis Kang (35-16). 35 years old. Last fight: KO loss to Melvin Manhoef. Elias Theodorou (6-0). 24 years old. Last fight: decision win over Ali Mokdad. Luke Harris (9-2). 35 years old. Last fight: TKO loss to Joseph Henle. Ryan Janes (5-1). Last fight: decision win over Keto Allen. Bastien Huveneers (10-4-1). Last fight: decision loss to Nick Hinchliffe. Kalib Starnes (12-8-1). 38 years old. Last fight: decision loss to Doerkson. 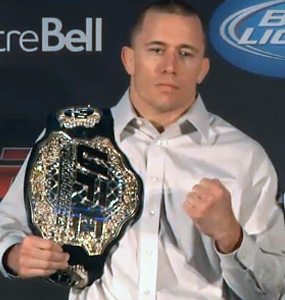 Georges St-Pierre (24-2). 31 years old. Last fight: decision win over Nick Diaz. Rory MacDonald (14-1). 23 years old. Last fight: decision win over BJ Penn. Jordan Mein (27-8). 23 years old. Last fight: TKO win over Dan Miller. Patrick Cote (19-8). 33 years old. Last fight: decision win over Bobby Voelker. Ryan Ford (20-4). 31 years old. Last fight: KO win over Brendan Tierney. Sean Pierson (13-6). 37 years old. Last fight: decision win over Lance Beniost. Claude Patrick (14-2). 32 years old. Last fight: decision loss to Brian Ebersole. Sheldon Westcott (7-1-1). 28 years old. Last fight: decision win over Nic Herron-Webb. TJ Grant (20-5). 29 years old. Last fight: KO win over Matt Wilman. Mark Bocek (11-5). 31 years old. Last fight: decision loss to Rafael dos Anjos. John Makdessi (11-2). 27 years old. Last fight: decision win over Daron Cruickshank. Sam Stout (19-8-1). 28 years old. Last fight: decision win over Caros Fodor. Jesse Ronson (11-2). 27 years old. Last fight: decision win over Ryan Healy. Graham Spencer (10-1). 29 years old. Last fight: submission win over Mukai Maromo. Mike Ricci (8-3). 27 years old. Last fight: decision win over Colin Fletcher. John Alessio (34-16). 33 years old. Last fight: NC with Dave Mazany. Alex Ricci (6-1). 30 years old. Last fight: decision win over Kevin Morin. Shane Cambell (8-1). 25 years old. Last fight: submission win over Stephen Beaumont. Antonio Carvalho (15-6). 33 years old. Last fight: TKO loss to Darren Elkins. John Fraser (11-4). 35 years old. decision win over Tyler Toner. Tristan Johnson (8-3). 29 years old. Last fight: decision win over Will Romero. Brad Cardinal (16-9). 34 years old. submission loss to Michael Karkula. Louis Fisette (6-1). 22 years old. Last fight: submission win over Brent Fryia. Gavin Tucker (7-0). 26 years old. Last fight: submission win over Lyndon Whitlock. Josh Machan (9-4). 26 years old. Last fight: submission win over Behrang Yousefi. Lenny Wheeler (6-2). 26 years old. Last fight: submission win over Adam Lorenz. Will Romero (9-4).30 years old. Last fight: Decision loss to Johnson. Josh Hill (9-0). 26 years old. Last fight: decision win over John Fraser. Yves Jabouin (18-8). 33 years old. Last fight: KO loss to Brad Pickett. Ivan Menjivar (25-10). 30 years old. Last fight: submission loss to Urijah Faber. Mitch Gagnon (9-2). 28 years old. Last fight: Submission win over Walel Watson. Syd Barnier (5-3). 31 years old. Last fight: decision win over Stephane Pelletier. Curtis Brigham (11-5). Last fight: submission win over Mike Adams. Mike Davis (10-3). 26 years old. Last fight: submission over Adam Bodwell. Stephane Pelletier (6-2). 27 years old. Last fight: decision loss to Barnier.